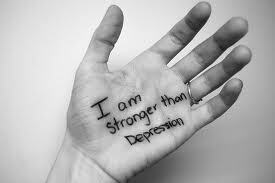 Depression is something I think we all go through, but it’s how we handle it that can make a huge difference. What am I supposed to do with my life? How am I going to pay off my student loan? Why am I always looked over for promotion? Why am I always so bitter and angry? Why do I feel so lost? Honestly, I had no answer. In order for someone to love me, I have to love myself. (that was the first step, learning to love myself). Second, I had to realize not everyone is going to like me….there are going to be doors shut in my face and not everyone is going to be nice to me. Third, I had to learn to forgive and forget others that have wronged me (not so easy to accomplish). No one in my family knew of my depression or noticed any signs because I was careful not to show it around loved ones. When a person starts saying words such as, “I wish I was dead” or “I wish I had never been born”; those are words of concern. 1. I looked in the mirror at myself and declared the fact that I am loved by my Heavenly Father…now, you may not be a Christian, that’s fine….but know that you are loved no matter what others may think or feel negative towards you. 2. You have a purpose. By not having a professional title in front of your name does not mean you are any less important. 3. Learn to forgive yourself and others. 4. Always remember, you are not alone….reach out to others that are hurting. Helping people that are depressed can and will help you through your problems. You may realize what you are going through is nothing compared to someone else. 6. STOP worrying so much – worrying leads to depression. Solution: Write all your problems on a piece of paper, toss it in the fire, and put it all behind you. Let Go and Let God or just simply let go….. Please find someone you can talk to and a shoulder you can cry on – it’s important to get it all out of your system. I may not have covered all options here and I understand everyone’s situation is different, but you get the picture…..No one’s perfect! This Concludes Mimi Jenkins’ Moment of Truth!